Corinthian Events' founding partners share over 50 years of experience. In starting the company their goal was to create a place people were excited to come to every day. You spend too much time at work to not enjoy it. Over 19 years later, the team members at Corinthian Events are not only colleagues, but family.The office mantra that anyone will chant anytime, "Don't worry, I got your back". "If I could only choose one word to describe Corinthian Events, I think it would be 'thorough. 'I can ask them almost any question about an event and I can tell they've already thought about it before I asked.On my drive in to their events I always feel calm and relaxed, confident that it's going to be a good day.You can't put a price on that." Morris Beverly, Owner, A.V. Presentations Inc.
We instill loyalty in all our relationships — not only with our clients, but with our dedicated vendor partners as well. We love what we do. And so will you. Did you know? Courtney will go to great lengths to see reggae music live! With almost 30 years in the hospitality industry, Courtney Church has the knowledge and resources to individually tailor every facet of your event – no matter how unusual the request. Her background in food and beverage and wine sales go hand in hand with a palette that is second to none in Boston; she will fine tune your menus to ensure variety over even the lengthiest programs. Combined with diverse experience in special events, destination management, luxury hotel sales and travel, Courtney's meticulous sense of detail allows her to keep her team in step and ensure that every aspect of your event is impeccable. Recently added tools in her back are extensive talent booking and management and complex production design and show calling. When she has time to get away, Courtney is happiest jetting off to the Caribbean or Bermuda to kick back in the sun. Craziest event? 500 water guns, their inventor, and a party in elegant evening attire. Jill Tate commands a comprehensive knowledge of all aspects of conference and event planning, local tours, and transportation. Together with her partners Courtney and Mary she loves the challenges of running one of the largest event and destination management companies in New England. Each day is different, each event is different, each employee is different. Event planning is truly in her blood; even as a teen, her desire to surround herself with good people had her constantly throwing parties (she says her house was THE house) and by high school she was planning full service ski trips for her friends. 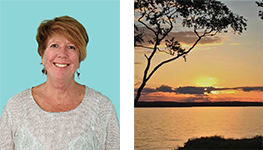 Jill holds a Bachelor's of Science degree in Leisure Management and Tourism from the University of New Hampshire and has the designation of Destination Management Certified Professional (DMCP). Outside of the office you can find Jill boating on the Westport River, biking or lounging with friends on Elephant Rock Beach. Jennifer has worked in the hospitality & events industry since her first job at the age of 16 and has never left! Prior to coming on board here at Corinthian events, Jennifer founded JMI Branding Forward, a boutique branding & social media management company focusing on the brand management of luxury wedding, lifestyle & event companies, skills she sharpened while Sales & Marketing Director at Peterson Party Center (now Peak Event Services). Her hospitality skills however were honed while managing some of Boston's top restaurants including Mistral where she oversaw the special events department, marketing and PR. She has been an active member in many local and international event associations and is a graduate of University of Vermont, with a Self-Designed Major in Small Business Management & Entrepreneurial Studies. She lives in Medfield with her husband and two children and when not cheering them on from the sidelines of a field, from the pool deck, court or track, -she can be found on the beach (or by the fire) sipping a cocktail (or two) and noshing on something delicious and probably not totally healthy! Did you know? Rich was the only guy in our office for almost 6 years. God Bless Him. Following a brief stint working for an airline at Logan Airport, Rich Tate began his hospitality career in 1986 as a Night Audit Manager and afterwards as a Front Office Manager at two local hotels. He hopped across the Atlantic in 1989 to work at a London-based incentive travel firm, where he learned how to create and successfully run incentive travel programs for groups of 10 to 400 guests. After over five years of traveling Europe and the world, Rich returned to Boston in 1995 where he met Jill - his future wife and partner of Corinthian Events - while working at the same destination management company (Jill actually interviewed and hired him!). Rich eventually missed traveling and went back to work for a couple of meeting and incentive travel companies, before being asked to join Corinthian Events in September 2006 as Office/Operations Manager. Rich loves being involved with their two kids' high school activities, and in his remaining time he loves to travel, cook, play golf, and enjoys all sports. Afraid of heights? Tamara recently went sky diving at 10,000 feet over Newport - talk about thrilling! 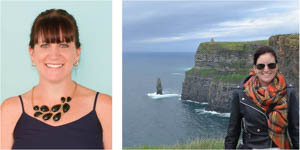 Tamara O'Malley has worked in the event industry since 2006, focusing in event production and design. She initially developed a specialty in floral, but over the years she has grown into a full-service event professional. Tamara joined Corinthian Events in 2010 as a Program Manager and was quickly promoted to Account Manager after learning the ropes. Her favorite part of working at CE is not only event planning, but building relationships with clients and exceeding their expectations. Tamara has strong problem solving skills and is calm, cool and collected under pressure. Outside of work, she enjoys cooking and entertaining family and friends, reading a great book on the beach and placing a bid on the ponies at the Saratoga Race Track! Need a healthy meal inspiration, Jamie is your girl! She spends every Sunday meal prepping for the entire week and we all like to take inspiration from what she brings in for lunch each day. Jamie Hellesen joined Corinthian Events in April 2013 with more than ten years' experience in the event planning industry. Her background encompasses wedding planning, restaurant management, and destination management, and she spent over six years as an account manager at a large Florida-based DMC. 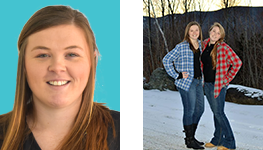 Jamie is a New Englander at heart – she grew up in Southern New Hampshire – and is excited to be continuing her work in destination management here in Boston. Clients will notice her impeccable organization and detail, and she makes multi-tasking under pressure look like a breeze. When she's taking a break from the logistics of your event, Jamie enjoys working out, spending time with her nieces and nephews, and traveling the globe to visit family and friends. Did you know? Jennifer spent 8 months living on a dairy farm in 2012 in The Berkshires as a cheese maker – she was in charge of making their bloomy rind and fresh cheeses! Jennifer Logan joined Corinthian Events in September 2013 with 12 years of industry experience ranging event planning and business management to hotels and catering. She has a deep love for all things gastronomy; Jennifer went to culinary school, loves menu design and planning, and is even working on earning a Master's in Gastronomy from Boston University. While she was raised as a Bengals fan, she's learned to like the Pats ever since moving from the Midwest to Boston for her undergrad – she earned a Bachelor's in Business from Northeastern in 2002, focusing on Entrepreneurship and Small Business Management. She has been event planning since college, and her knowledge and creativity will make her an invaluable asset to all of our clients here at CE. Outside of work, you might bump into Jennifer on one of her long walks around the city, enjoying oysters and Belgian beers, or skiing and snowshoeing in Killington, VT.
Fun Fact? Claudia loves fishing and tries to go as often as possible! "Striped bass fishing in Boston is unreal during the summer!" Claudia's passion for events began when she was just a toddler, watching fashion shows being put together from the ground up in her hometown, Milan, Italy. When she was 18, she decided to leave Italy, and pursue her event planning dreams and attended Boston University, where she graduated with a B.S. in Hospitality Management. Claudia began her career as a Wedding Planner and then worked for a Boston-based Destination Management Company. Her upbringing and experience is a valuable asset to Corinthian Events: she is also fluent in 4 languages (French, Spanish, Italian and English)! 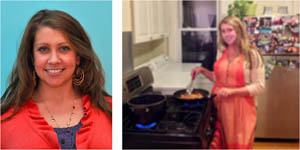 When she's not wedding pinteresting or fantasizing about her next event's décor, you can find her whipping up a delicious Italian meal for her husband and friends, cardio kick-boxing at the gym, superfan-ing at a Bruins game, or looking up recipes featuring her favorite: Nutella, of course! The one thing she can't live without? Cake. She plans to have at least five kinds at her wedding. Dawn joined Corinthian Events in September of 2016 with experience planning both large and small scale events. Having started working in events during one of her coops at Northeastern University, she realized her passion for events and has never looked back. Dawn's organizational skills and attention to detail will keep your event on track, and she prides herself on always doing the best she can for her clients. Her favorite parts of events are working with all different people throughout the planning process, and then seeing the final event come to life onsite. She thinks there is no better feeling than when you are at an event and see all of the pieces come together successfully. Outside of work, you can find Dawn trying new restaurants around the city, spending time with family and friends, looking up healthy recipes to make at home, or planning her next vacation! Where's your happy place? Vanessa's is in the kitchen or at the beach. Vanessa Bassett has been planning corporate meetings and events since 2000. From an intimate business retreat to a conference for a 1,000, Vanessa approaches each event with the goal of making it the ultimate program for her clients. After working at Corinthian Events from 2010-2011, Vanessa moved down South to start a family. Now she is excited to be back at the place she loves, doing what she loves: creating events, getting knee-deep in contract negotiations and building long lasting relationships with her team and clients. Outside of the office, you can find this creative cook and wine-loving Bostonian working out at OrangeTheory. She needs it to keep up with her 2 young, active, and adorable daughters, their sweet dog Lucca and extremely funny & sports enthused hubby. Free time? Hanna's played slow pitch softball every year since 1996! Hanna's event planning career was inspired by a college mentor's suggestion to “be a face for problems." 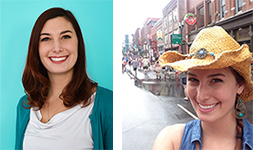 After encouragement to leave hometown Nashville, TN and head to Boston for graduate school in communications and PR, Hanna's friends and professors finally convinced her that her love for creating fantastic experiences could be channeled into her profession. She thrives on creativity, challenges and positivity, all important to the success of her events. Hanna developed her event planning foundation for two years managing large-scale public events and intimate corporate events in Greater Boston before joining Corinthian in the fall of 2017. In her free time, Hanna can be found training as a S.H.I.E.L.D. Agent with workout classes and superhero films, or cheering on the Crimson Tide at the Alabama bar with her southern kin. Roll Tide! Fun Fact – Marjorie has danced since she was 3! Fred Astaire and Ginger Rogers are her spirit animals. Marjorie joined the Corinthian team with over five years of experience in the Boston event industry. A local to the Boston area, Marjorie loves to help clients enjoy all her city has to offer. A fan of logistics and details, her love for planning began on the stage, working backstage for live theater and events around New England. Now in event management, Marjorie believes true collaboration is what helps when developing creative events and building strong relationships. Working with great clients and awesome vendors to create and execute incredible events is what makes it exciting to come into work everyday. Outside of work, you can find Marjorie enjoying a craft brew on a Vermont road trip, or soaking up the sun on a beach or maybe a sailboat. Free time? Shira is a huge Dave Matthews Band fan! She has seen him in concert 18 times (and counting)! Shira Brandt found her passion in event planning back in 7th grade with her Bat Mitzvah. Since those days, she's graduated from University of Maryland in College Park with a bachelor's Degree in Communications and has jumped into the hospitality industry with both feet. Shira's favorite parts of events are seeing the client's reaction once everything has come together and the excitement behind the planning process. Outside of work, you can find Shira at a country concert or her favorite, Dave Matthews and exploring everything the city (and its outskirts) has to offer, from hiking local waterfalls to a Red Sox game, she's never still for long. 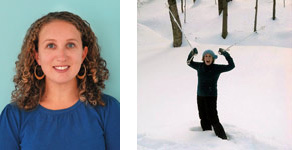 Whether its fishing on the Cape or skiing in Upstate New York, Shira is always on the move. Emmy knows every word to every song on every Backstreet Boys album. Even the ones that came out after their 1998-2002 reign. Emyline (Emmy) shipped up to Boston from Connecticut in 2011 where she attended Suffolk University and hasn't left since. With experience working in hospitality, weddings and DMC's, she brings a well-rounded skill-set to the table. Her passion for event planning and production stems from her love for the performing arts. She often compares event planning to choreographing a performance, saying that a performance is like an event – it takes months of practice (or planning) for just 2 minutes on stage (or 4 hours at a venue). Emmy remembers this philosophy through the entire planning process. Her “practice makes perfect" attitude leads her when planning the “perfect" event. During her free time, Emmy enjoys trying new restaurants, attending concerts and binge watching How I Met Your Mother. Danielle loves to travel! One of her absolute favorite trips was hang-gliding and canyon jumping in Switzerland. Originally from New Jersey, Danielle joined the Corinthian team with almost a decade of the experience in the hospitality industry. A James Madison University graduate with a degree in Business and Hospitality, Danielle has continued to pursue her passion for event planning and design by working with nonprofit and corporate clients across New England. Danielle's favorite parts of events are the creativity of the design process and getting to know people from all over the world. 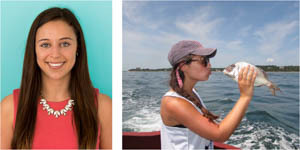 Outside of the office Danielle likes to go to concerts, explore outdoors, and taste-test as much ice cream as possible. Grace came to Corinthian Events with over five years of experience in the nonprofit space. My favorite parts of events are the creative design process, building relationships with clients, and attending to every small detail throughout the planning process. Outside of work I love spending time with my boyfriend in Montréal, practicing speaking French, hanging out at the beach, working on interior design sketches, collecting art history books, and seeking out the best $1.00 oyster deals near and far. As a kid, Thanksgiving at Carolyn's house in Maine always included aunts, uncles & cousins for the weekend and grew to as many as 37 people at times. They are still very close and enjoy an occasional "cousin's weekends" in the summer with as many and more! Carolyn Edwards was born in Boston but grew up on an island in Maine. She is a Mainer at heart. Carolyn's strong artistic and creative talents have taken her from working in children's theatre programs to starting her own small jewelry and designer clothing business. Organization, creativity and seeing the "vision" of her customers has always been her passion. When not spending time with her husband and three college age children, she loves to travel. Her favorite spot in the world is a small island in Maine where her family is lucky enough to live. My parent's home is where we all gather throughout the year. You get there by boat and it makes you feel like you are worlds away. The lawn goes down to the ocean and no two sunsets are alike! Long before Pitch Perfect, Theresa sang with her college a cappella group, the Mount Holyoke College V-8s. A love that never dies. Theresa Lamkin has a passion for technology and a background in non-profit fundraising. Her understanding of event needs is combined with a unique ability to leverage technology to meet those needs. She has the capacity to translate concepts into ideal high-tech solutions while explaining them in non-technical terms. From preliminary requirements to post event analytics, Theresa's extensive attention to detail shines through in her client interactions. When free from the computer screen, there is nothing Theresa loves more than exploring the North with her 3 children. Fun fact? 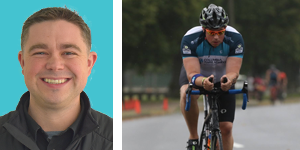 Jake has completed two World Marathon Majors as well as multiple triathlons. A New Hampshire native, Jake found his passion for graphic design late into his college years. After majoring in Sport Management, Jake accepted a job within minor league baseball where he grew honed his craft and quickly rose up the ranks to take over the team's production and creative services. After spending multiple years in the sports industry, Jake moved onto the experiential agency field where he expanded his skill set providing artwork and design direction for nationwide tours, one-off activations and pop-up stores across the country. In his downtime, Jake participates in local road races and triathlons, as well as actively supporting multiple animal rescue organizations. Jeremy began his events career bussing tables for a major Boston catering company as a second job to support his musical aspirations. He has worked in business operations around the events world for catering, lighting, rental and planning companies. His multi-faceted skills are ideal for his role with Corinthian, which he joined in September 2018. Having seen major events from different sides, he knows just how important the finer details can be for an event to run smoothly. Logistics and problem solving are his forte, and thinking on his feet is where he is at his best. Need something last second? Can't get your table or prop level? Need a few more lights hung? Jeremy is on the job. Still playing in bands around Boston, the 17-year bass player, Jeremy's free time is spent slapping his four-string or running along Wollaston Beach in Quincy. A true New Englander, Perry grew up in a shipyard; constantly around the hustle and bustle right in her backyard, she has always had a drive to set and achieve goals. Her passion for events landed her with six internships throughout her college career—from nonprofit fundraising at Joslin Diabetes Center to cocktail parties in Florence, Italy. Perry is always ready for a new challenge, as long as it allows her to be creative! Outside of the office you can find Perry riding her beach cruiser along the Charles, walking her dog, with her nose in a great book, or all three at once! Fun Fact: Eleanor was born a fraternal twin! A recent graduate of Boston University, Eleanor joined the Corinthian Events team with several internships under her belt. However, it wasn't until she was placed in an unexpected internship during her time abroad in London when she really fell in love with the event planning world. While liaising with clients and coordinating with designers, Eleanor discovered a passion for planning and organizing that she yearned to pursue further. And so, she did! When she's not at the office, Eleanor loves to attend Red Sox games with friends or relax with a good book. She's actually reread the Harry Potter series every summer since she was a kid! Fun Fact: Siobhan loves to travel, but her favorite trip was to an orphanage in Haiti. Siobhan is a recent college graduate with a passion to dive deeper into her career. Her events background stems from planning a golf tournament for a nonprofit foundation her family started to organizing a major concert at her college. The most rewarding part of events for Siobhan is seeing all of pieces come together and making people happy. In her free time, she enjoys spending time in New Hampshire with family and friends by the lake, and you can almost always find her with her dog. !